Congratulations to Kirk Caldwell, Winner of Event #32: $1,500 No Limit Hold'em ($668,292)! Kirk Caldwell wins Event #32! 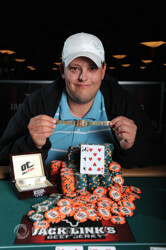 Three days ago 2,828 people put up $1,500 in an attempt to take down a WSOP tournament and win a shiny, gold bracelet. Today only one man remains. Kirk Caldwell was able to best Ben White heads up and win Event #32: $1,500 No-Limit Hold’em, taking home $668,276 in prize money. The $1,500 buy-in events are always an interesting investment, as they are among the smaller buy in tournaments that the WSOP offers, so the fields are always quite large. With many people playing in the event, there were casualties every day that ranged from first-time WSOP participants to seasoned professional. On day one of play, we saw many notable players get sent to the rail, including Tom Dwan, Zachary Gruneberg, Jerry Yang, Randy Lew, Phil Laak, Joe Cada, and Allen Cunningham. 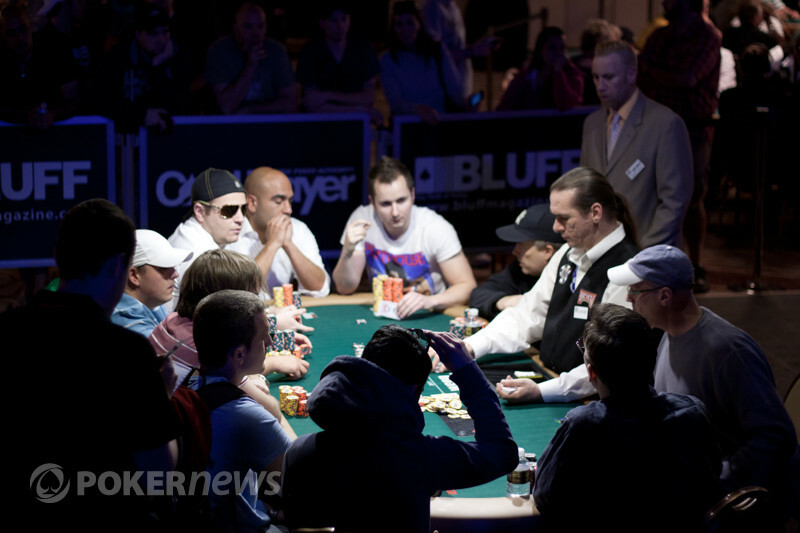 While these players’ chips were taken from them, other players were able to absorb chips to make their stacks grow and progress to day two. 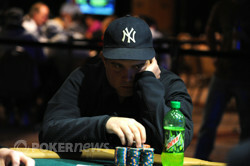 Among the latter was day one chip leader Adam Lippert, who finished the first day with an impressive 144,800. After the chaos of day one in this massive event, 362 players returned for the second day of play. Among the players who hit the rail during day two: Chino Rheem, TJ Cloutier, Layne Flack, Brett Jungblut, and Eddie Blumenthal. In the end, 35 players were able to best the field and survive on to the final day of play, their sights on the gold bracelet and the $4,242,000 prize pool. Play on day three went at a breakneck pace, whittling down from 35 players to the final nine in just under five hours. Once play at the final table began, the pace seemed to quicken. Within the first forty minutes of play the final nine had become the final four. The first four players eliminated were lost in the first six hands of final table play. Once four-handed play began, the play slowed down immensely. Kirk Caldwell and Mark McLaughlin led the way through most of four-handed play, the latter of which sending his housemate, Gabriel Morin to the rail in fourth place. Caldwell managed to win a huge pot off of McLaughlin during when play was three-handed, his beating McLaughlin’s on a flop. McLaughlin staged a comeback from this hit but was unable to make anything materialize, which brought us to heads up play between Kirk Caldwell and Ben White. Caldwell began head to head play with the most chips and never relinquished his chip lead. After roughly an hour of heads up play, Caldwell managed to push White all in holding against White’s . 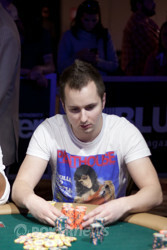 Five cards later White failed to improve and Caldwell became the next WSOP champion. PokerNews extends its congratulations to Kirk Caldwell who will be taking home his first WSOP bracelet as well as $668,292 in prize money! Thanks for following along and stay tuned to PokerNews throughout the rest of the series for the most current updates! Kirk Caldwell had the button and opened to 300,000. Ben White three-bet to 900,000 from the big blind, Caldwell moved all in for effectively 3.5 million, and White called. Caldwell stood up and walked away from the table, his friends screamed from the rail, and the flop fell down . The on the turn was an interesting card. It didn't give White the best hand, but it gave him three more outs to a jack, which would counterfeit Caldwell's wired eights. Only a handful of people were railing, but the yells were deafening when the spiked on the river. For the first time all evening, Caldwell let out all of his emotion, throwing his hands in the air. White somberly shook Caldwell's hand, but we're sure he'll be smiling somepoint later tonight when he realizes he's just banked $414,918! Ben White had the button and raised to 250,000. Kirk Caldwell called, and the flop came down . Caldwell checked, White continued for 310,000, and Caldwell check-raised to 1.31 million. White tank-folded, and Caldwell took down the pot. Kirk Caldwell and Ben White have become the last two men standing (or sitting, rather). Caldwell has a strong chip lead but anything can happen in heads up play. 42 minutes remain in this level and if they do not finish by the level's conclusion, the two men will return to play tomorrow. In a raised pot, the flop came down . Marc McLaughlin led out for 200,000 only to be raised to 500,000 by Kirk Caldwell. McLaughlin responded by moving all in and Caldwell made the call. McLaughlin's fives were ahead at the time, but Caldwell jumped to the lead when the struck the turn. The river bricked out for McLaughin, coming and he was sent to the rail in third place. Marc McLaughlin has been open-shoving frequently from both the button and the small blind for the last 30 minutes or so. He hasn't been called once, and has chipped up above 1.7 million. Kirk Caldwell completed from the small blind, Marc McLaughlin checked in the big, and the flop came down . Caldwell check-called 110,000 from McLaughlin. Both players checked the on the turn, and the on the river, and Caldwell opened up for a pair of eights. McLaughlin flashed a before mucking, and Caldwell picked up the pot.